Benefiting The Barrett Foundation, Inc.
We couldn't be more thrilled about making our debut in Albuquerque! 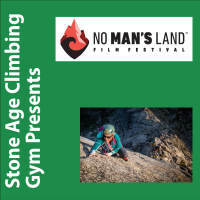 We are atingle with anticipation as we partner with Stone Age Climbing Gym to host a screening at the KiMo Theatre. This event will be a part of Stone Age Climbing Gym's annual climbing Festival, Prime8, coming to you October 20th through 26th. No Man's Land will screen on October 26th. Stone Age Climbing Gym is thrilled to see the number of women involved in this sport become more and more significant with the passing of years. Staying in line with their established tradition, Stone Age will donate all profits from this event. They feel that a stable and safe environment is critical to allow the spirit of adventure to blossom within an individual and for this reason, we plan on making the donation from this event to The Barrett Foundation, a women/children-centered organization. Please join and support our goal to create a history of motivating audiences to implement and inspire change!